When she’s not working, Denise likes to get out on the ocean to swim and windsurf. She also likes traveling, gardening, playing music, spending quality time with her cats, and drinking coffee. Denise is involved in a long-term research project where they observe wild dolphins in the oceans where they live. She and her team go out to Bahamas for five months every summer to collect data, including behavioral observation, photo identification, and tracking of family lines. A major focus of the project is recording underwater behaviors and sounds to better understand dolphin communication systems and social structures. While Denise’s family didn’t have a scientific background, spending time in nature through camping with her family and playing in the woods was a big part of her childhood. When Denise was 12 years old, she was flipping through the Encyclopedia Britannica, and she stumbled upon the dolphin and whale pages. It fascinated her to think about what was going on in their brains. Watching the aquatic explorations of Jacques Cousteau on TV as a kid also exposed her to the wonders of the underwater world. Dian Fossey, Jane Goodall, and Cynthia Moss were three extraordinary female scientists who inspired Denise to observe dolphins in the wild. Denise has had to face the mental and psychological challenges of dealing with people who have told her she can’t do the work that she loves. She believes it is important to never give up on your vision and to find people who support you and the goals you are working towards. Denise’s research also involves a variety of physical challenges, including extended periods of swimming in the ocean, loading and moving heavy equipment, and enduring (or escaping) storms at sea. In addition, there are practical and scientific challenges like fund-raising and analyzing data when she is working in the lab. For Denise and her team, receiving a donation of a boat to use in their research was a major success. Another major success was when the pod of spotted dolphins they have been studying now for years finally became accustomed to their presence and began to exhibit behaviors around the team members and their boat. They have also had exciting opportunities to follow the dolphins to nearby locations where they have observed interesting interactions such as fighting between the spotted dolphins and bottle-nosed dolphins. Recently, Denise had a wonderful time visiting Naples, Italy for an astrobiology conference. These types of conference intersect with her field because there are discussions focused on potential communications with other intelligent life. While in Naples, Denise was able to take a side-trip with a colleague to see an active volcano, and the resulting tarnish on their silver jewelry was a reminder to her that the earth is active and dynamic. Spending weeks at a time on a boat in remote places with about 12 people living in close quarters is a perfect recipe for the creation of quirky occurrences. One tradition that they developed to break up the routine was to have a formal night partway through the trip. Everyone dresses up, and they spend a fun evening amongst the tiki torches on the back deck of the boat. They try to plan a special dinner, and past years have featured a delicious desserts-only menu. Take a moment to visualize what you want your life to be, and work to make it happen. Follow your passions. 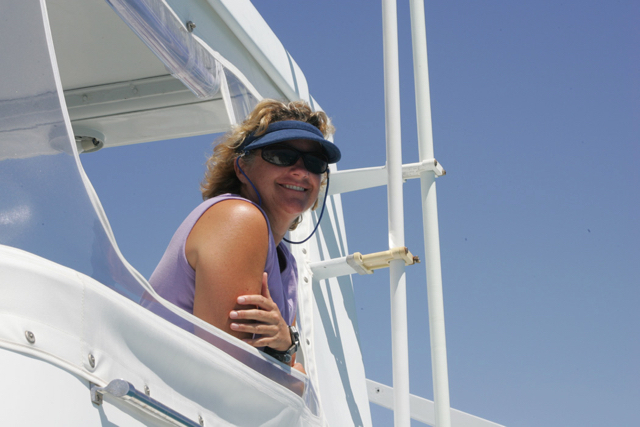 Denise began her unprecedented, long-term study of Atlantic spotted dolphins in 1985. For 30 years, she has spent five months each summer living with a pod of Atlantic spotted dolphins. Her research involves observing these dolphins in their natural habitat to better understand their behavior, social structure, communication, and habitat use. Through this work, Denise has created a long-term database tracking family units, reproduction, and genetic relatedness in this pod of spotted dolphins. Denise and her colleagues have also built an interactive device that facilitates basic communication between humans and dolphins. They are also working on computer algorithms to find patterns in underwater recordings of dolphin vocalizations.